Acknowledged author Eugene F. Brigham wrote Corporate Finance: A Focused Approach comprising 840 pages back in 2016. Textbook and etextbook are published under ISBN 1305637100 and 9781305637108. Since then Corporate Finance: A Focused Approach textbook received total rating of 4 stars and was available to sell back to BooksRun online for the top buyback price of $82.00 or rent at the marketplace. NOTE: This ISBN does not include Access code. 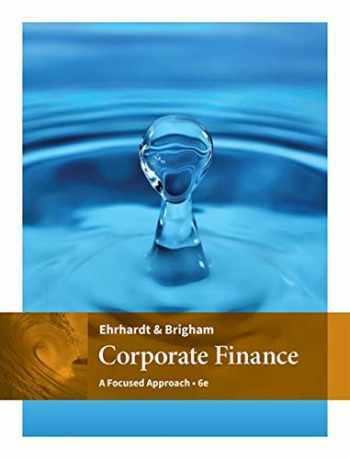 It is Standalone bookFocus on the financial concepts, skills, and technological applications that are critical for you in today's workplace with Ehrhardt/Brigham's CORPORATE FINANCE: A FOCUSED APPROACH 6E. With its relevant and engaging presentation and numerous examples, you will learn the latest financial developments as you also learn how to maximize a firm's value in today's changing business environment. You will master the features and functions of spreadsheets by using chapter Excel Tool Kits, Build a Model problems, and Mini Cases that encourage "what-if" analysis on a real-time basis. As part of its comprehensive product package, Ehrhardt/Brigham's CORPORATE FINANCE: A FOCUSED APPROACH 6E includes MindTap Finance, CengageNOW, and the best-selling Aplia™ Finance as optional learning solutions that complement the book's focused presentation of corporate finance fundamentals and help you to become "First in Finance".